The shrimp boats “Volunteer” LR 175 and “Wahine” LR 57, sailing home past Heysham Head. “Volunteer” was registered at Lancaster as LR 175 having been built at Crossfield’s of Arnside in 1917. 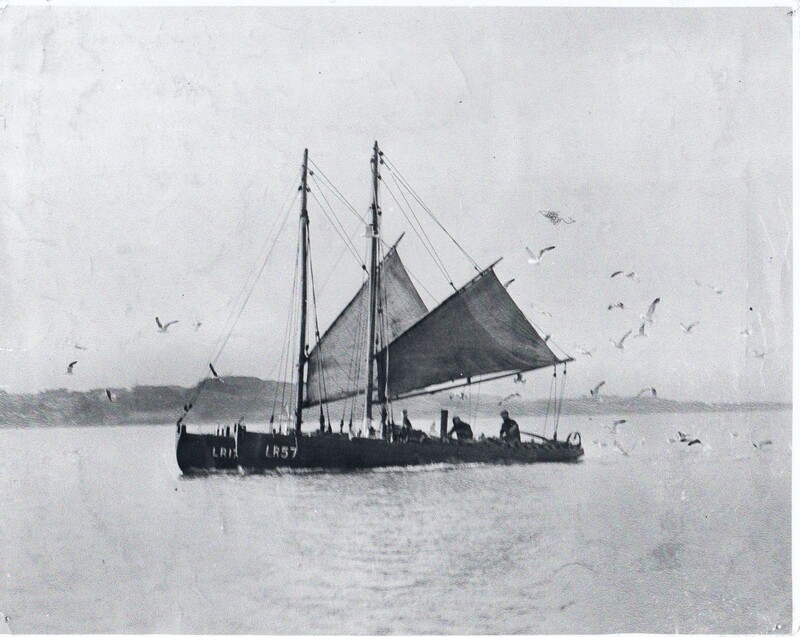 She had a motor and was rigged with a mainsail, topsail, foresail and jib. She was later owned by George Mount of Morecambe, James Morley of Morecambe (6.10.23) and Dennis Aldren of Morecambe (22.5.53). “Wahine” was registered at Lancaster as LR 57, built at Annan, Scotland in 1926, was rigged as a smack with a mainsail, foresail and jib, also with a motor. She measured 32ft overall with a beam of 8ft and weighed 8.42 tons. She was worked by a crew of two.